Which of these pharmaceutical stocks should you prefer for your portfolio? GlaxoSmithKline is researching the field of bioelectronics for potential new advances. Image source: GlaxoSmithKline. Investors like pharmaceutical stocks because of the combination of dividend income and growth prospects that they have historically provided. Both GlaxoSmithKline (NYSE:GSK) and Merck (NYSE:MRK) have been leaders in the pharma world for a long time, and both companies have developed lifesaving medications that millions of people rely on for their health. Yet some consumer advocates worry that pharmaceutical companies are profiting too much from their breakthroughs, charging high prices that put a strain on the government programs and health insurance providers that manage the costs of healthcare more broadly. With those challenges, investors want to know which stocks offer the best combination of risk and reward. Let's look more closely at Glaxo and Merck using a range of common metrics to evaluate their merits. Despite the pharmaceutical industry's recent challenges, GlaxoSmithKline and Merck have held their own over the past year. On a total-return basis, Glaxo has posted a nearly 10% advance since the end of June 2015. Merck has trailed that figure but has still managed to eke out a nearly 4% rise. Simple valuation metrics have their limitations, and in the case of Glaxo and Merck, looking at trailing earnings in relation to their share prices leads to some misleading conclusions. Glaxo's current price-to-earnings ratio is greater than 100, implying an extraordinarily high valuation. Yet most of the reason for the company's temporarily low earnings is that Glaxo has incurred billions of dollars in restructuring charges and fair-value balance sheet adjustments related to foreign currency movements. Similarly, Merck has incurred restructuring charges of its own, along with foreign-exchange losses related to Venezuela's currency devaluation and adverse legal settlements, and that has boosted its trailing P/E to 35. Future earnings expectations take those factors out of consideration, and there, the two stocks compare more fairly. GlaxoSmithKline trades at about 16 times forward earnings, while Merck comes in slightly cheaper with a forward multiple of 15. On a valuation basis, Glaxo's superior stock performance hasn't made its shares look much more expensive than Merck's. The largest pharmaceutical companies typically pay substantial dividends, sharing the success of their blockbuster drugs with their shareholders. Merck offers a dividend yield of 3.3%, which is above average for the market as a whole. GlaxoSmithKline, however, has a much higher yield of 5.6%, and that doesn't even include the special dividend of roughly $0.57 per share that investors received earlier this year. When you add in that amount, Glaxo's effective yield rises to nearly 7%. Glaxo has also been more diligent in boosting its dividend payments over time. The company's payouts vary from quarter to quarter as many European stocks' dividends do, but the overall trend in local-currency terms has been upward. Since 2007, Glaxo has more than doubled its annual dividend payments, and it has made at least token increases every year since at least 2001. By contrast, Merck has been less regular about its dividend increases, including just minimal boosts over the past five years and flat payouts for most of the preceding decade. 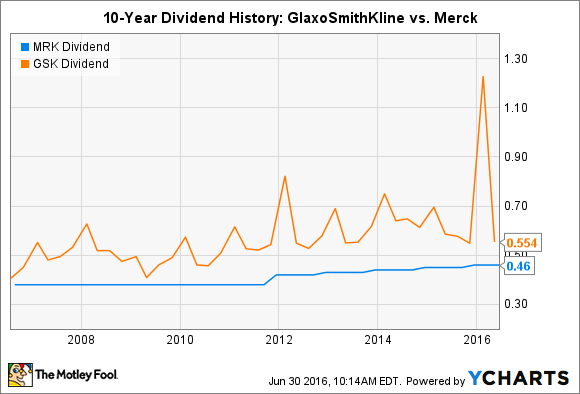 Overall, Glaxo's dividend treats shareholders better than Merck's does. Both Merck and GlaxoSmithKline have considerable growth opportunities, although the risk is always that pipeline products in development won't pan out the way that the companies hope. For GlaxoSmithKline, recent results have been extremely encouraging. HIV therapies Tivicay and Triumeq produced extremely strong growth in the first quarter of 2016, with sales climbing 60% and 193% respectively. Glaxo's pipeline of about 40 potential products has several products nearing possible approval, including treatments for rheumatoid arthritis and a shingles vaccine. At the same time, Glaxo has unlocked cost savings to bolster its profits. Even though its asthma blockbuster Advair will decline with generic competition expected in the near future, Glaxo is still working to overcome disappointment in the oncology field and handle concerns about pricing of its drugs. Merck is dealing with similar issues. The company's blockbuster Januvia and Janumet treatments for diabetes are still doing reasonably well, even though the key products are facing substantial competitive pressures. Merck has also seen promising pipeline moves, including the likely filing for approval of osteoporosis therapy odanacatib later this year. Poor results from hepatitis C treatment Zepatier haven't made investors happy, and growth in Merck's Keytruda cancer drug have lagged behind a rival treatment, Bristol-Myers Squibb's Opdivo, in terms of sales. Yet the company is interested in looking at acquisitions to bolster its growth prospects further. On this point, both Merck and Glaxo have similar growth prospects and face many of the same risks. All in all under this analysis, GlaxoSmithKline has a slight edge over Merck, due largely to its more generous dividend payouts. Investors will need to keep an eye on both companies to see how they weather big-picture issues in the pharmaceutical industry, but if it can deliver on its full potential, GlaxoSmithKline looks like the better buy right now.